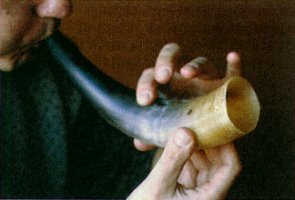 Replica of a horn from Västerby in Sweden. It is made from horn of cattle and has four finger holes. Similar instruments have been in use until recently in Scandinavia. The original horn is now in Dalarnas museum, Falun, Sweden. 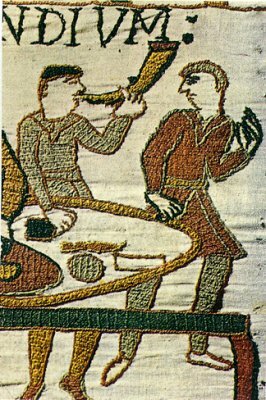 On the Bayeux tapestry one can see a horn blower, apparently sounding the signal to 'come and eat'. The tapestry was made around 1070, shortly after William of Normandy had landed and conquered England.